When I'm writing journal prompts and designing journal pages, I often think in terms of balance -- the good and the bad, the ups and the downs, the successes and the challenges. They are the realities of life and I think it's important to explore them all. Then, after a whole lot of exploration, I sometimes need a bit of a nudge back to the positive. 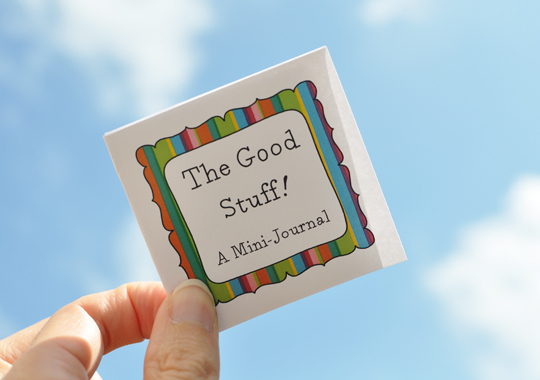 With that in mind and on a whim (which is mostly how I operate around here), I cooked up a mini-journal devoted entirely to the good stuff, and I made a copy for you, too. 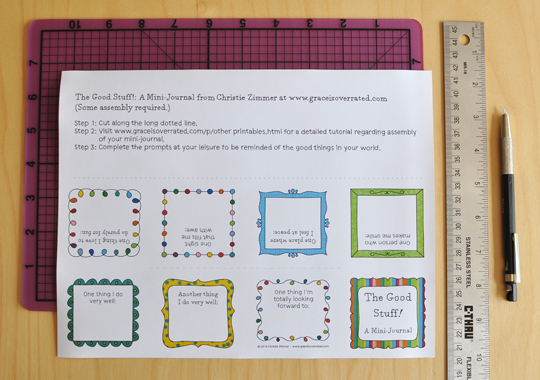 I warn you, there is some assembly required, so I've also prepared my first ever tutorial to help you assemble your very own Good Stuff! mini-journal. Before we begin, I've included two photos to show you what your mini-journal will look like when it's completely assembled. You can see that it is indeed mini, measuring less than 3 inches wide and just over 2-1/2 inches tall. Each prompt is one-off. You'll probably be able to finish the whole thing in one sitting. Then you can put it away somewhere and take it out again when you need to be reminded of all of the good things in your world. This journal's folded book format is adapted from Esther K. Smith's awesome book, How to Make Books: Fold, Cut & Stitch Your Way to a One-of-a Kind Book. It's the very first book in her first chapter called Instant Books. In a moment you'll see why. The first thing you'll need to do is assemble your production materials. 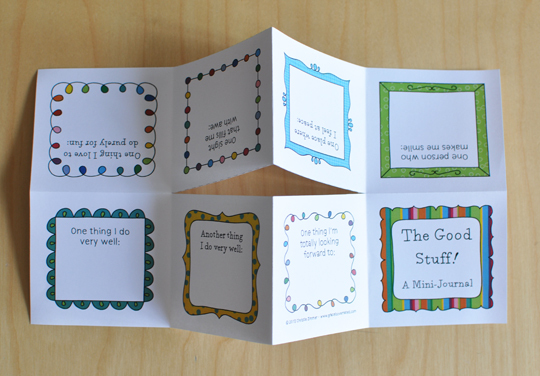 You can download the mini-journal template page here. It's a two-page pdf file with a colourful version and a colour-free version, as always. You'll also need a cutting tool of some sort. I used a craft blade and ruler, but scissors will also do the trick. 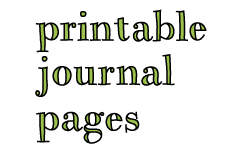 Begin by cutting along the long dotted grey line to separate your journal from the title info. 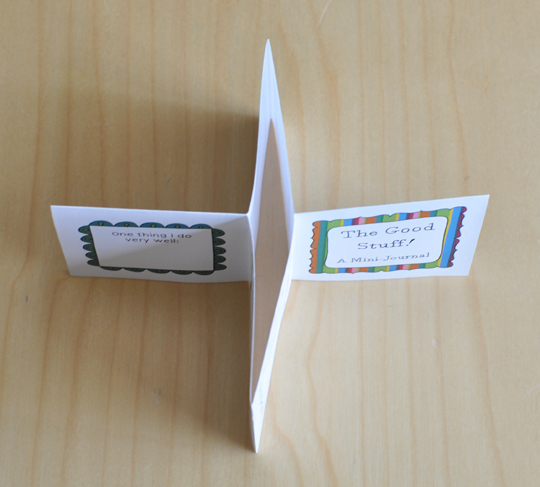 Then, fold the remaining part of the page in half, lengthwise. Fold it in half again, this time at its width. Next, fold up the two ends to meet at the middle. 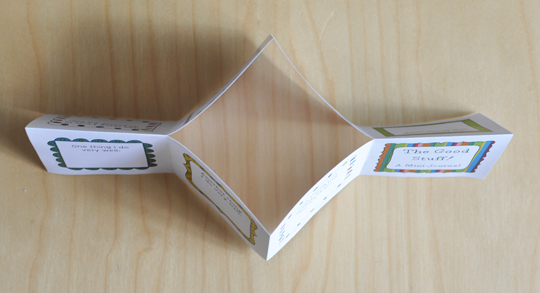 When you're done, you'll have a page with large accordion folds. Pinch the two ends together along your original lengthwise fold line. Push the two ends together. 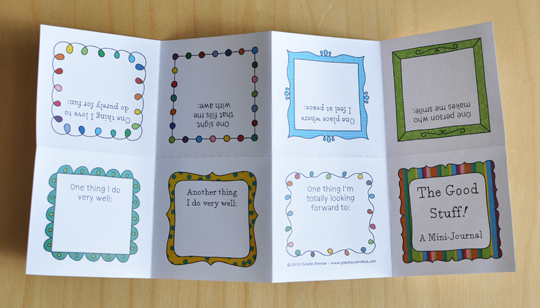 The last step is to make one final fold, folding the prompt "One thing I'm totally looking forward to:" backwards so that it ends up being the back cover of your mini-journal. Et voila! A complete journal, ready for your pen, pencil or markers! One final word before you begin. 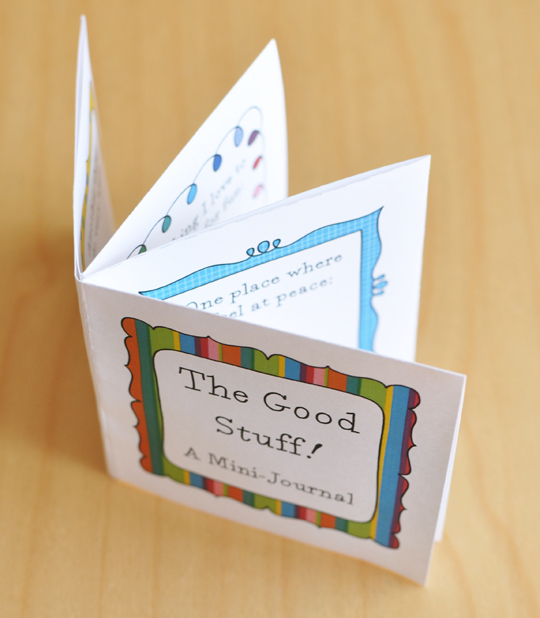 Do not be discouraged if, upon completion, your mini-journal is not perfect. All of the folding involved means that edges might not be exactly straight and corners might not be just right. After I finished my journal, I spent a few minutes massaging the folds, pressing the page edges and corners with my fingers, and I'm really happy with the end result. So there you go. 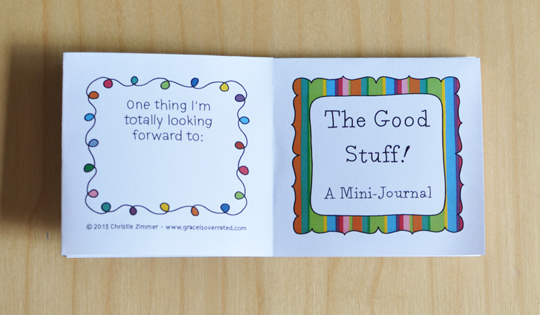 A nearly instant mini-journal devoted to the good stuff in your world. I hope you love it! Let me know if any of the instructions are difficult to understand and I'll make any necessary changes to the tutorial. Also, let me know what you think of this new journal because I think I can see myself making a bunch more! 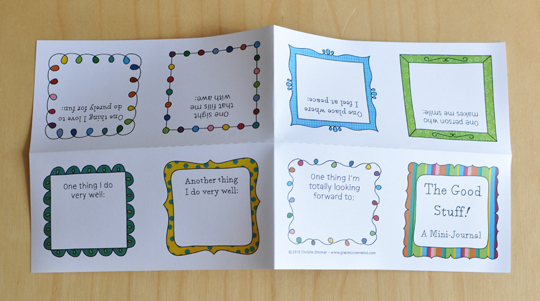 Its so perfect going to print out four and we're going to do it after dinner, and then put them in our gratitude jar. Thank you again for another amazing prompt! Thank you so much! This is such a sweet little journal...can't wait to print and complete it! This is so cute! I printed them out for my daughter and I. I found the instructions easy to follow and I can't wait to do this! Thank you! Thanks, Mary! I hope you and your daughter have lots of fun putting your mini-journals together! Christie, how adorable! This will be perfect for my daughter's book club activity this month. I will print one out for me too! I love it and how its only one page. cool. 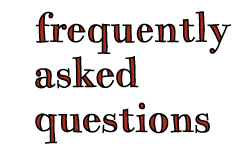 How did you get your blog to look like it was written in marker on the links on the side of the page. Hi Anndrea! 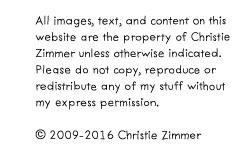 I drew the artwork for the links on the side of the page by hand in Adobe Illustrator using a pen tablet. In Illustrator, you can draw with a pen tablet and mimic the look of just about any writing tool. I used the pencil tool to draw the letter outlines in black, then filled in the colour after. I saved the artwork for each link as an individual image file and uploaded each file to the Blogger template, then added the links.